Most blogs or writing sites would like to include surprise players that made the all-star team, and then rip them for not being good enough. I feel like that is an exercise in futility, because A) every team in the MLB must be represented, even the teams devoid of all-star caliber players; and B) because the players and coaches vote the remaining players in. That means that enough people around the league thought that guys like Brock Holt and Joe Panik played well enough to warrant all-star consideration. Who am I to say that the players and managers are wrong? If the all-star game was about selecting the best 25 players in each conference from around the league, then those two stupid rules wouldn’t exist. However, because of these rules, a few worthy baseball players just missed out on making the Mid-Summer Classic. Here is a list of guys I think should have made the all-star team. The current CF and former 2B has 9 HRs, 45 runs scored, 41RBIs, and 13 stolen bases to go along with a team-leading 2.9 WAR. He started off slow, but picked up the pace the last month and a half. He’s the reason a prospect like Betts is in the outfield. 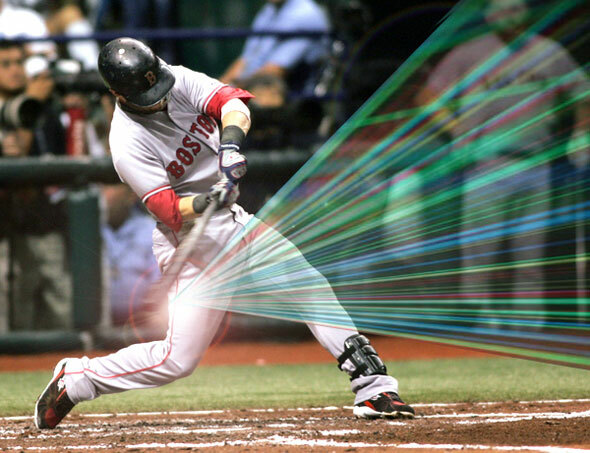 The “Laser Show” has recovered from a wrist injury that marred his 2014 season. With a .306/.367/.452 stat line to go along with 9 HRs, 34 runs scored, and 33 RBIs; Pedroia just missed out on his 5 all-star appearance. 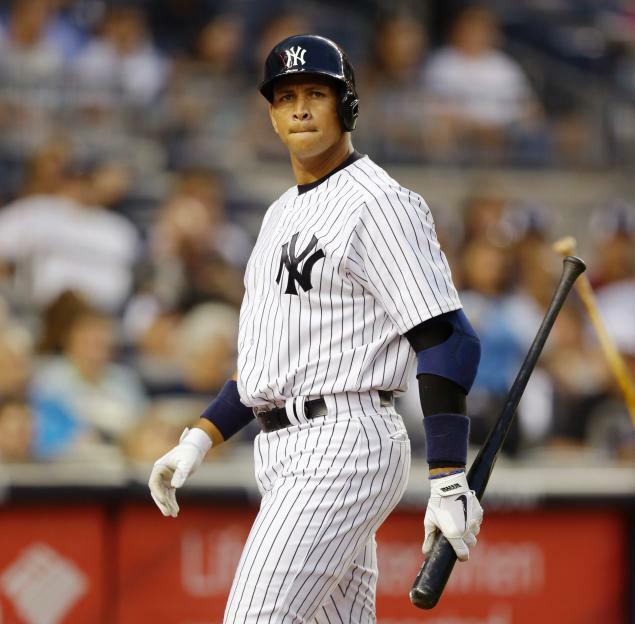 He has the same WAR as all-stars Nelson Cruz and Prince Fielder, is second on the Yankees with 16 HRs, and has found the fountain of youth at age 40. I know he didn’t make the team because of the Biogenesis Scandal, but if guys like Cruz and Peralta can get a second chance, why can’t ARod? I’m going to give you a blind stat comparison. 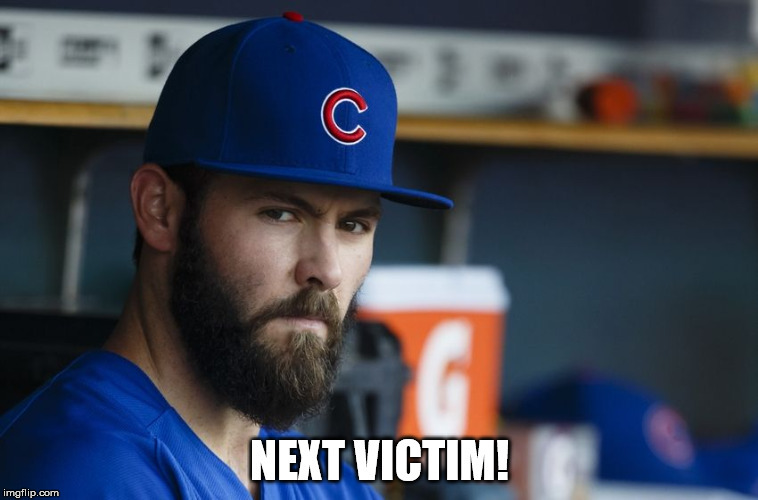 Which player is Arrieta? Player A: 112.2 Innings Pitched, 7 wins, 4 losses, 114 strikeouts, 2.80 Earned Run Average (ERA), 1.05 Walks+Hits/Innings Pitched (WHIP), and 2.9 Wins Above Replacement (WAR). Player B: 113.1 IP, 8 wins, 5 losses, 114 SOs, 3.34 ERA, 1.08 WHIP, and 2.1 WAR. If you guessed that Player A is the Cubs’ ace, then you would be correct. But who is Player B? That would be World Series Hero and Giants’ pitcher Madison Bumgarner. According to Fangraphs, Arrieta is sporting a WAR better than all-star pitchers Zack Grienke, Gerrit Cole, Michael Wacha, and the aforementioned Bumgarner. It’s a shame he wasn’t even good enough to make it on to the Final Vote ballet. At least he’ll be an all-star in my heart. The 1B competition is historical brutal, and this year is not exception. With guys like Paul Goldschmidt, Anthony Rizzo, and Adrian Gonzalez not only having all-star seasons but MVP-type seasons it’s not too difficult to see why Votto narrowly missed an ASG birth. If he can take solace in anything, it’s that he’s the odds on favorite to win the Comeback Player of the Year Award this season. Bryce Harper and the tremendous Nationals’ pitching staff get all the attention and headlines, which is why it’s easy to forget about the season Yunel Escobar has been having. 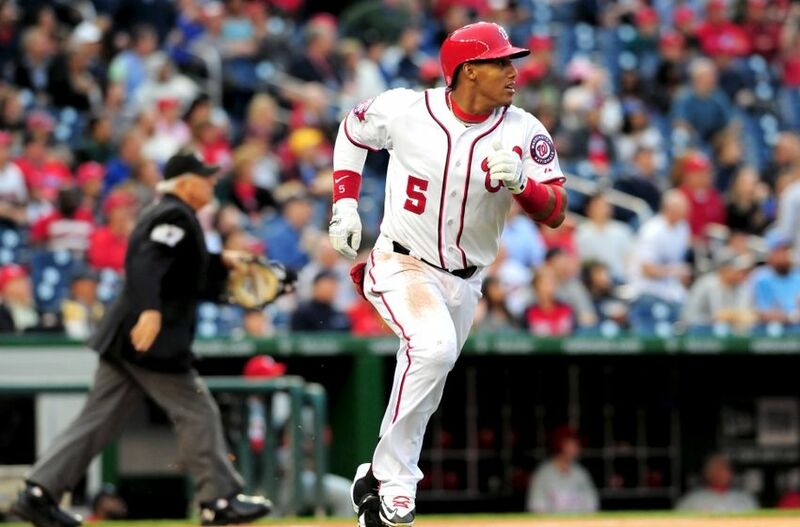 With a .315/.365/.405 stat line as well as 40 runs scored, 27 RBIs, and solid defense at both 2B and 3B, Escobar has been a pleasant surprise for the Nats. The 9 year veteran from Cuba has acted as Harper’s wing man in the line-up, due to the injuries to Anthony Rendon, Jason Werth, and Ryan Zimmerman. Regardless of who gets voted in by the fans, 8 very worthy all-stars will be left empty handed. 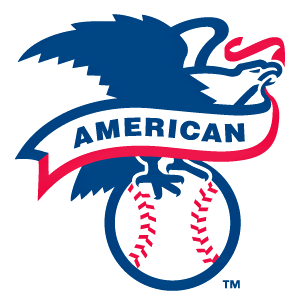 Guys like Twins 2B Brian Dozier, Rockies SS Troy Tulowski, Cardinals SP Carlos Martinez, Mets CL Jeurys Familia and Kansas City 3B Mike Moustakas, league leaders at their respective positions, will be left out of the action. For many on this list, this would be their first all-star appearance. 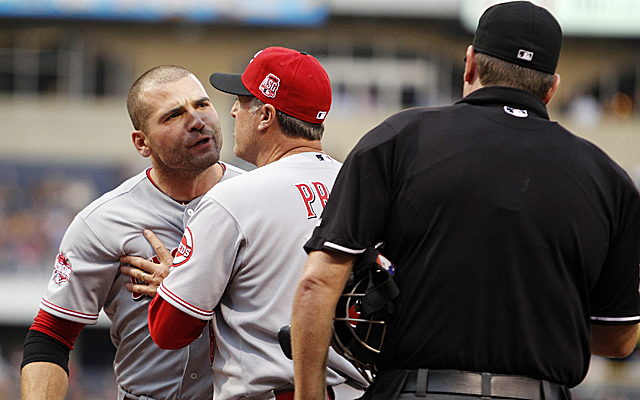 It’s a shame that, because league rules, many deserving players are hung out to dry by the MLB. 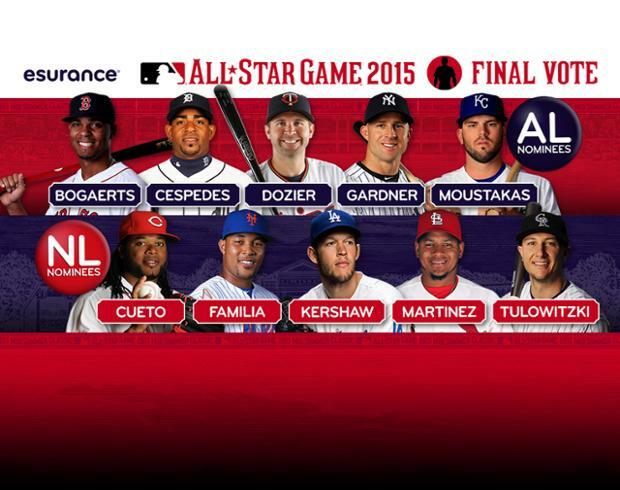 Speaking of rules, a big issue with this year’s ASG has to do with fan voting. For much of the summer, Kansas City Royals players were dominating the leader boards whether they deserved an all-star appearance or not. Fans from opposing teams flooded the online ballots to ensure that players like Omar Infante and Alex Rios wouldn’t be voted in as starters. Many are clamoring for the MLB to change voting rules or the criteria for players to appear on the ballot. This year a broken system was exposed and now this will be a big issue heading into the offseason. And I think this is pretty great. The ASG voting has been broken for a long time. Actually the whole ASG in general hasn’t been very good in a long time. Players like Omar Infante in 2010, Mark Redman and his 5.71 ERA in 2006, and Gil Meche in 2007 with his 9-13 record do not deserve all-star births. 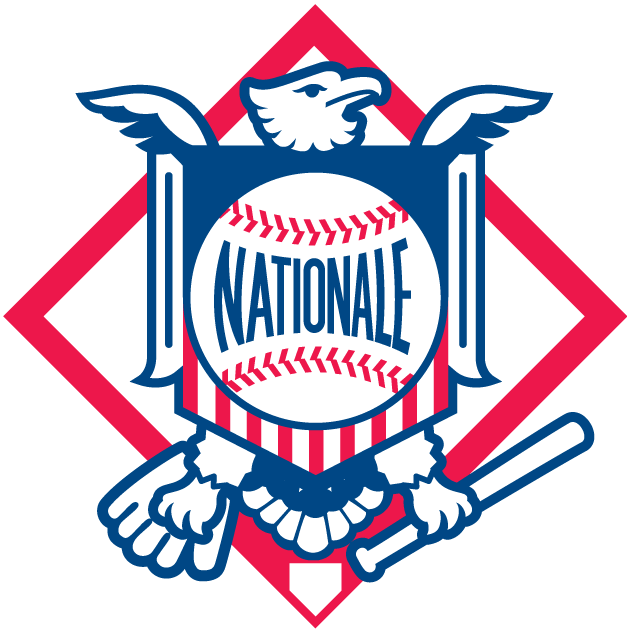 Not all teams need to be represented, and not all players need to be on the ballot. 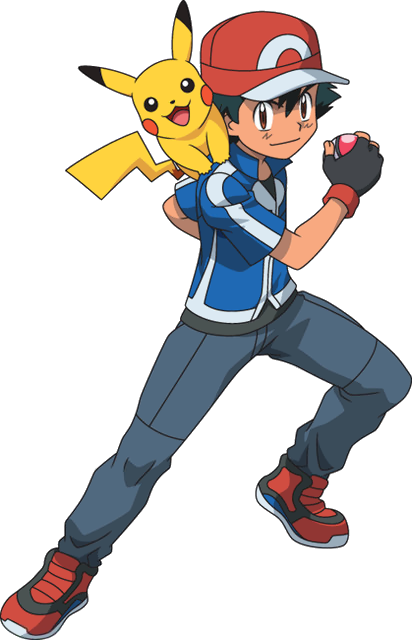 Players who deserve to be in the game should play in the game. I’m tired of seeing utility players and rosters with 8 closers because the game counts. 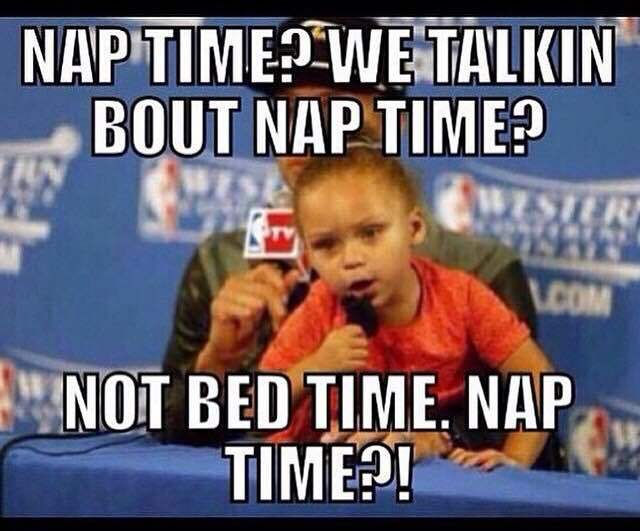 No other all-star game in any other sport counts for anything. It’s just a fun exhibition game where star players show off their skills. The ASG needs to get back to it’s roots and allow the best players to play each, or else what almost happened this year is sure to happen in the near future. 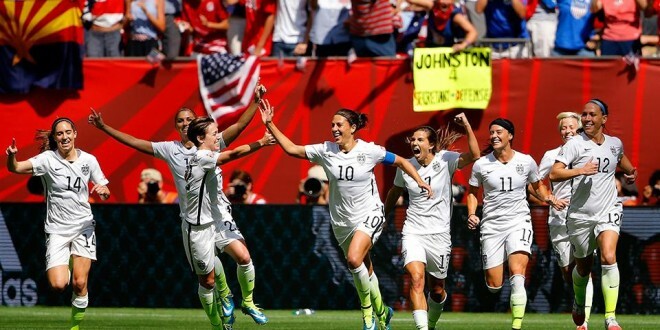 Yesterday, the US Women’s National Soccer team beat Japan 5 to 2 to win the 2015 Women’s World Cup. This is the team’s first World Cup since 1999, avenging a loss to the same Japanese squad in the 2011 finals. Carli Lloyd led the Americans with a hat trick (3 goals), which was the first in US Women’s soccer history. Because of her performance, Lloyd won the Golden Ball Award; which is the World Cup’s MVP. Plus, she made the longest goal I’ve ever seen from a professional soccer player. The team deserved this win, and the fame and notoriety that comes from it. Hopefully women’s soccer, and women’s sports in general, gets the boost it deserves from this showing. – The Spurs resigned Kawhi Leonard (5 years/90 million) and Danny Green (4 yrs/ 45 mil) and signed LaMarcus Aldridge (4 yrs/80 mil). They are now the Western Conference favorites. 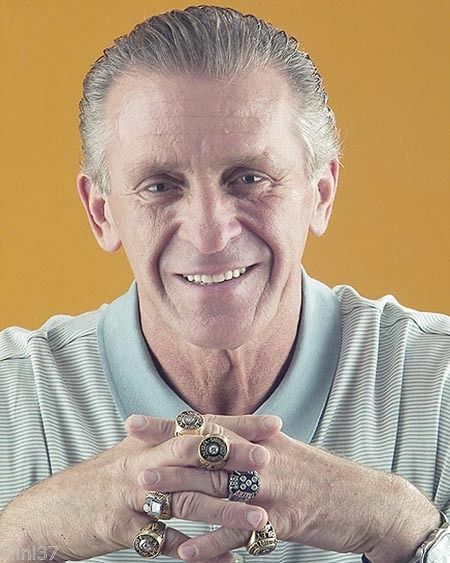 – Important free agents that resigned with their teams: Jimmy Butler (5 yrs/90 mil), Khris Middleton (5 yrs/70 mil), Draymond Green (5/85 mil), Kevin Love (5/110 mil), Marc Gasol (5/100 mil), Dwayne Wade (1 yr/20 mil), Paul Millsap (3 yrs/58 mil). – Important free agents that went to different teams: DeAndre Jordan (4 yrs/80 mil with Dallas), Greg Monroe (3yrs/ 50 mil with Milwaukee), Lou Williams (3 yrs/21 mil with LA Lakers), DeMarre Carroll (4 yr/ 60 mil with Toronto), Wes Matthews (4 yrs/ 57 mil with Dallas), Monta Ellis (4 yrs, 44 mil with Indiana), and Tyson Chandler (4 yrs/52 mil). The Mavericks replace old Tyson Chandler with “Young Tyson Chandler.” The dunks alone make this deal a win for Dallas. 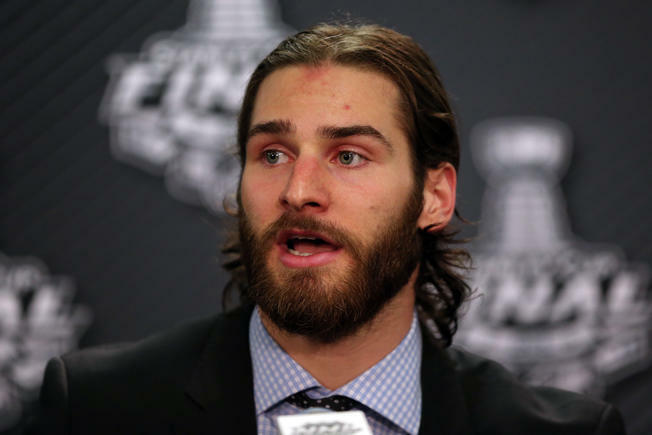 – Brandon Saad was traded to the Columbus Blue Jackets for Artem Anisimov, Marko Dano, Jeremy Morin, Corey Tropp and a fourth-round selection in the 2016 NHL Draft. 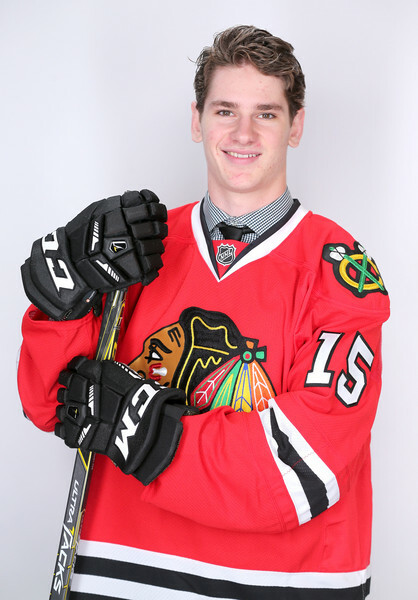 Anisimov then signed a 5 year, 22.75 million dollar contract with Chicago. – Buffalo sent defenseman Nikita Zadorov, forwards Mikhail Grigorenko and J.T. Compher and the No. 31 overall pick in the 2015 draft to the Avs in exchange for center Ryan O’Reilly and forward Jamie McGinn. 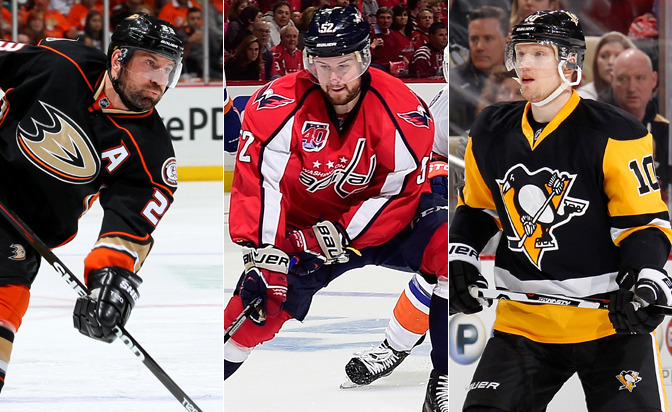 – Toronto traded winger Phil Kessel, forward Tyler Biggs and defenseman Tim Erixon to Pittsburgh for forwards Kasperi Kapanen and Nick Spaling, defenseman Scott Harrington, and two conditional draft picks. The final votes are due by Friday, July 10th. I will have more in depth analysis on the topic coming tomorrow or Thursday. Stay tuned. What the hell happened yesterday in the Barclays Center? Actually, a better question would be what the hell didn’t happen yesterday? Boogie Cousins was suppose to be the Lakers’ new hope. George Karl was suppose to impose his dictator-like will and turn the 2015 Sacramento Kings into the 2013 Denver Nuggets (literally; with Ty Lawson and everything). I was suppose to hit on more than 10 percent of my draft picks ( 😦 ). Even though the big dominoes do not fall in Brooklyn last night; a lot still happened. Now, I’m not going to give out grades to teams based off of how teams drafted. I’m also not going to grade prospects on how I think they will develop. 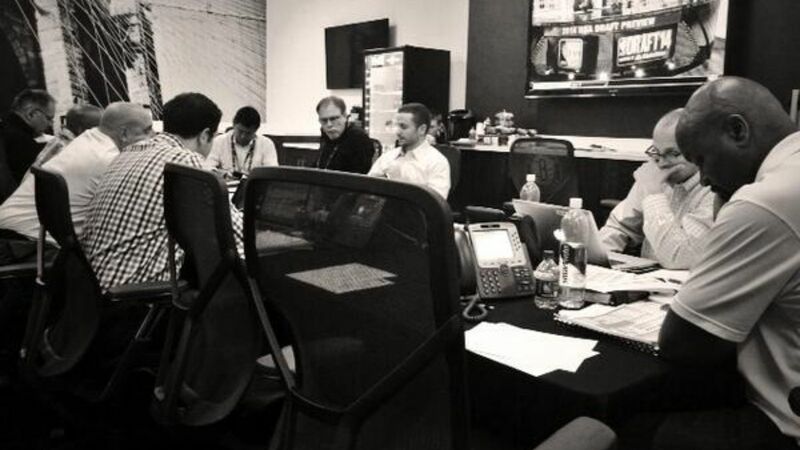 If Wednesday’s mock draft has taught me anything is that I am not Tom Cruise in Minority Report. Karl-Anthony Towns, Andrew Wiggins, Tyus Jones, and Zach LaVine appear to be the young foundation for the mediocre T’Wolves. Not to mention that those players are surrounded by intriguing prospects like Shabazz Muhammad, Gorgui Dieng, and Adreiane Payne. Add in the still developing Ricky Rubio and sprinkle in some sage-like wisdom from KG on his farewell tour, and Flip Saunders may have something cooking in the Twin Cities. By picking D’Angelo Russell the Lakers have not only positioned themselves to trade for an asset that can help the team “win-now” (BOOGIE!!! 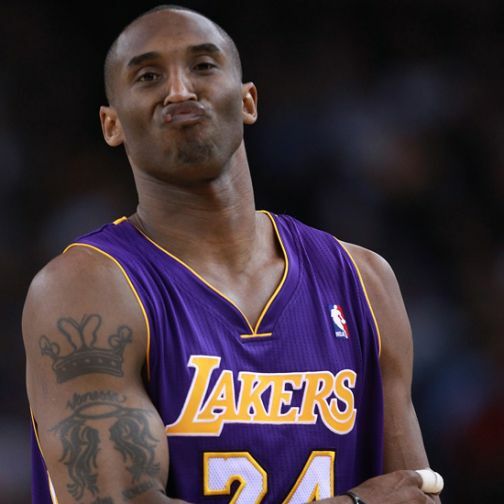 ), but they have also positioned themselves to be successful when Kobe Bryant decides to hang them up. O, and they have oodles of cap space, which always helps. Three big men enter: one or two big men leave. By adding Jahlil Okafor, the Ballin’ Bennys (please let that nickname stick) and Sam Hinkie have made the team’s front court situation very awkward. Maybe Embiid learned how to shoot threes during his rehab. Maybe Noel and Okafor are the new Sampson and Olajuwon or Parrish and McHale. Either way, something has to give and I think one of these guys is leaving Philly very soon. I have no idea why Melo is mad. The Knicks possibly took the best player in the draft (Porzingis) and a young player who can help them win now (Grant). If he doesn’t like their draft picks, then maybe he should pull a LeBron and start recruiting some high profile free agents (Love, Aldridge, Monroe, Jordan, etc.). 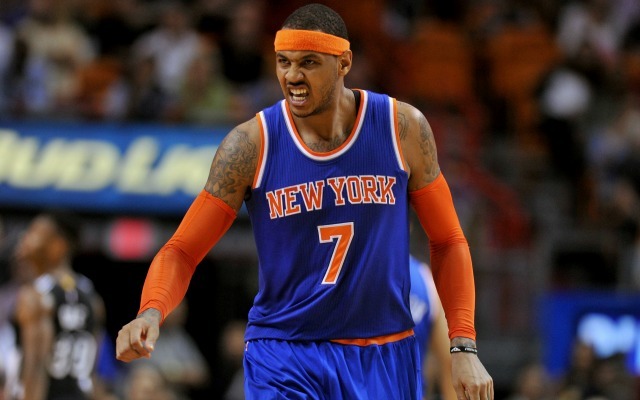 Trust the Zen Master, Melo, he has 11 rings to your none. The Orlando Magic get an A+ grade in swag this year. Emannuel Mudiay’s arrival in the Mile High City signals the end of the Ty Lawson era, and even he know it. 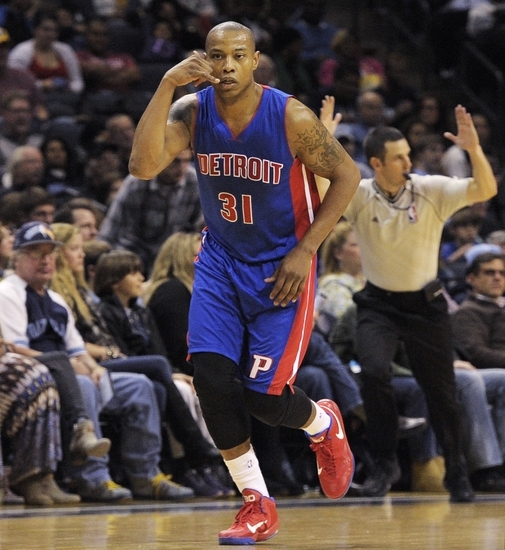 Does anyone else think that Stan Van Gundy just traded his old Caron Butler for a newer, upgraded version? Do you guys think that Michael Jordan is aware of what he’s doing? He loves picking the “best player available” even when they really aren’t. He loves picking guys who are All-Americans; guys who have won at the college level. Guys who have won National Championships. Guys who have a few wrinkles to iron out. Like there shooting ability, toughness, etc. Or guys who may not have “NBA” athleticism, but sure do have “NBA” skill. …The One That Got Away. 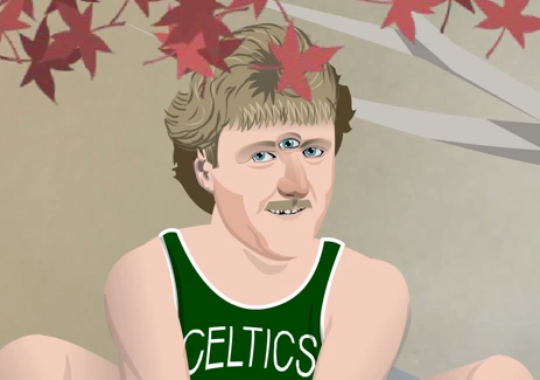 I know Larry Bird runs the Pacers. I know they essentially have their 2013 core returning minus Stephenson and West. And I know they have a hole at the power forward, but how do you not draft Cameron Payne at 11? He’s everything the Pacers need to take the next step. I guess I just need to trust the three-eyed Larry. I think Lyles will be fine. Booker is a solid pick for a team in desperate need of three point shooting. And boy can this guy shoot the J. He could be Russell Westbrook insurance, D.J. Augustin insurance, or Anthony Morrow insurance; either way Billy Donovan and OKC got another great young basketball player. The Thunder should be a force next season. 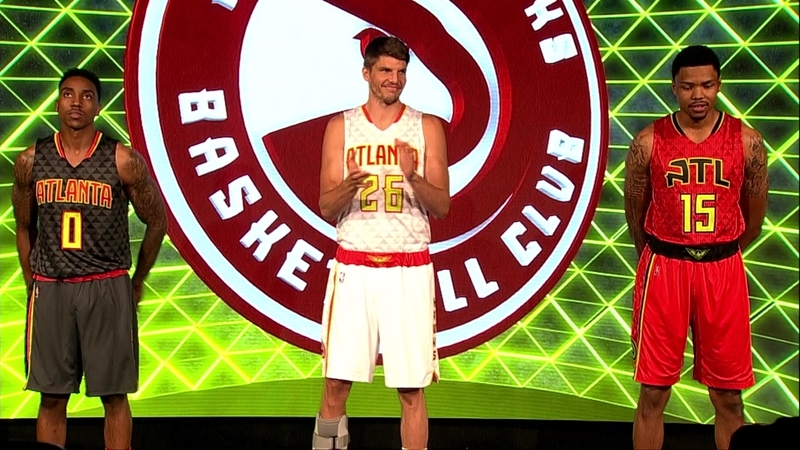 I think it’s sad that their new uniforms are more noteworthy than their addition of Tim Hardaway Jr. With that being said; he is a great scorer and Atlanta could definitely use more of that. 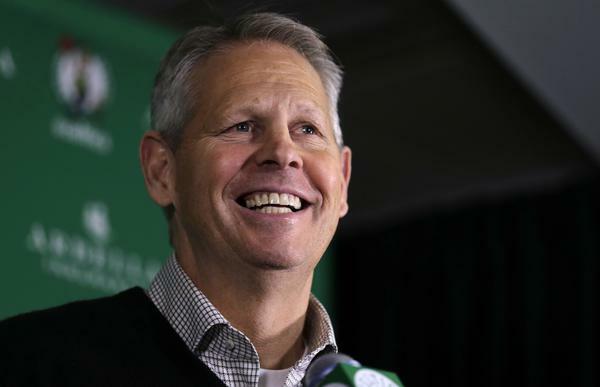 I guess Danny Ainge is trying to build a team full of Marcus Smarts. I mean that’s not the worst basketball line-up in the world. That title is a two-way tie between the “Baby Bulls” (starting Eddy Curry at center, Marcus Fizer at power forward, and Tyson Chandler at small forward), and the 2009 T’Wolves (Rubio as “New Isiah Thomas” and Jonny Flynn as “New Joe Dumars”). Greek Freak: check. Jabari Parker: check. Jason Kidd: check. The Bucks could have drafted Larry Sanders again and it wouldn’t have mattered. The Deer have such a strong core that any other young player they manage to develop is just gravy. The Rockets need a secondary ball-handler off the bench, yet they took a jack-of-all trades small forward. Why might you ask? 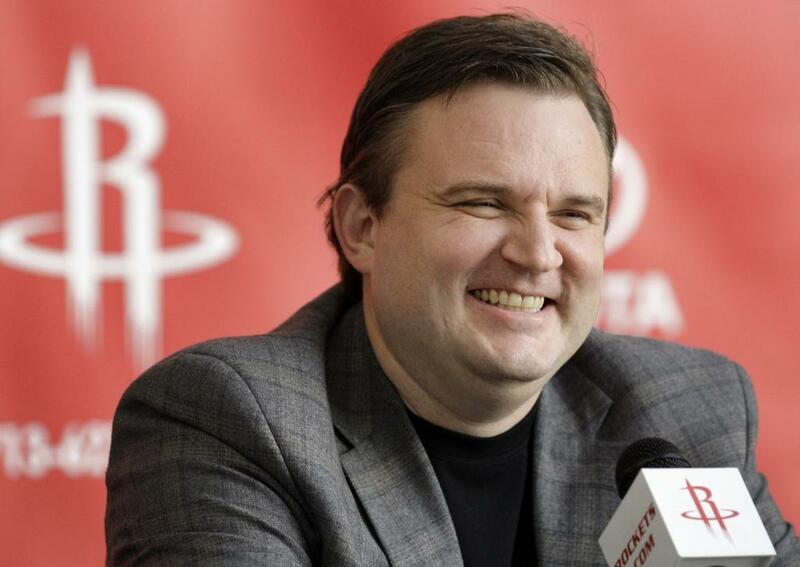 Because Daryl Morey doesn’t care about team needs. He views players as assets and he wants to best assets in the league. Dekker will find a place, either for Houston or another squad, but by tip off of the season opener, Dork Elvis will fill that need. The Wizards felt that replacing Paul Pierce was a more pressing need than finding a great third guard or back up big man. It’s hard to argue that logic with “small ball” becoming the league’s newest scheme. Oubre Jr. lacks a lot of polish and skill, but the talent and athleticism are there. 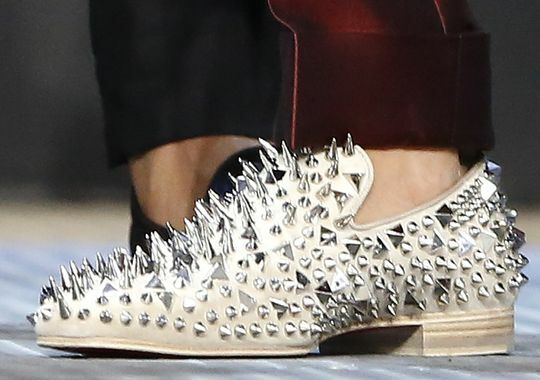 I mean, you can’t be a scrub with shoe game like that. Not much to say about this pick. 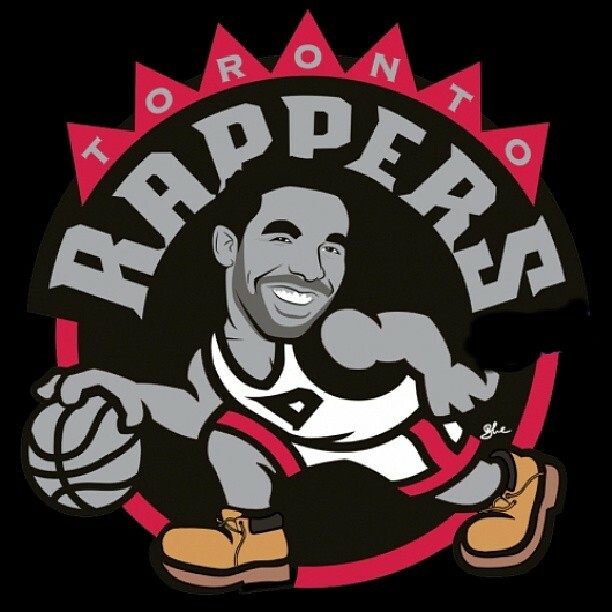 The “Drakes” filled a team need. 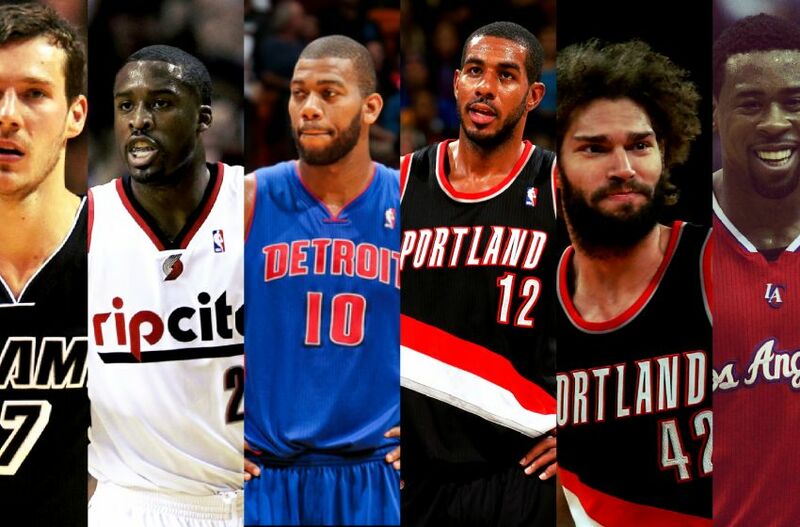 Now they need to be major players in free agency in order to round out the rest of their roster. 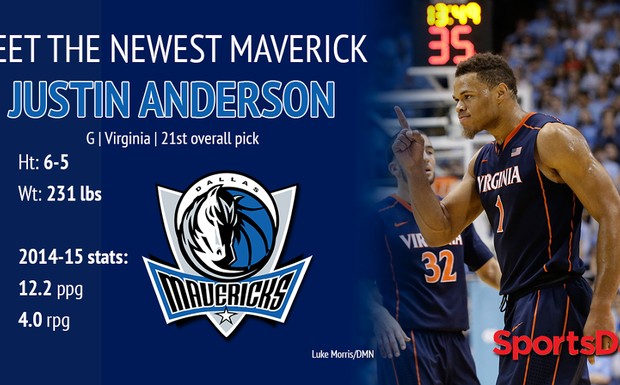 Justin Anderson might be one of the bigger steals in this draft. 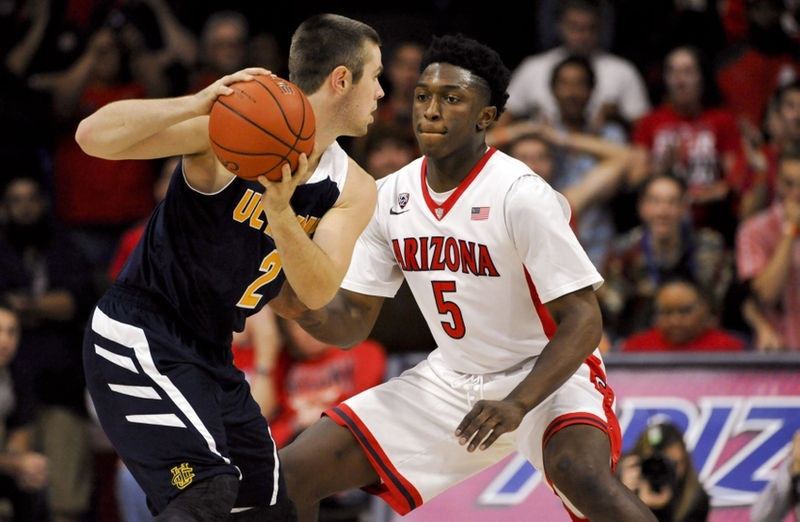 He’s a 3 and D wing, with the potential to grow into a team’s third or fourth option. With Monta Ellis and Al-Farouq Aminu testing free agency, the team has some holes at the guard and forward spot. 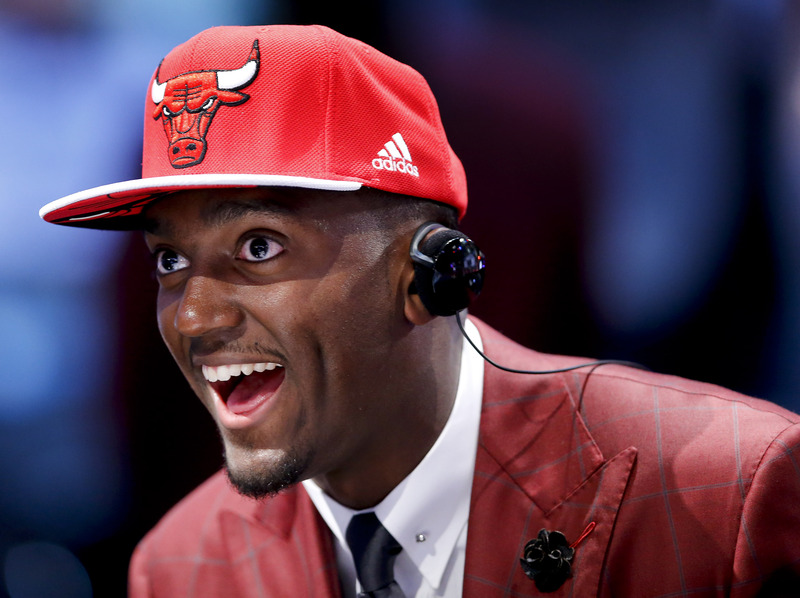 Bobby Portis was suppose to be a lottery pick, and now he’s Chicago-bound. Does this mean one of the Bulls’ front line talents (Gibson, Noah, or Gasol) on their way out? Or is Portis insurance in case all three are too beat up to be effective? Would you rather have a tenacious wing defender who can’t score, or a nimble big man who can’t defend the rim? Portland chose the later, but in the wake of the Warriors’ championship I believe they should have chosen the former. Being able to guard four or five positions has great value. 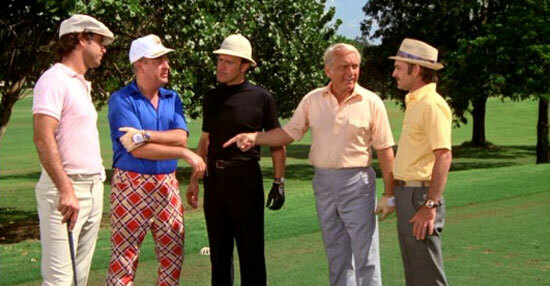 Then again, when you dress like Rodney Dangerfield from Caddyshack, it makes you wonder. Just finished ordering my Rakeem Christmas Cavs Christmas Day jersey. It’s Christmas on Christmas. I wish this was made up. Jarell Martin’s highest comparison was to that of Jeff Green. The Grizzlies have Jeff Green. 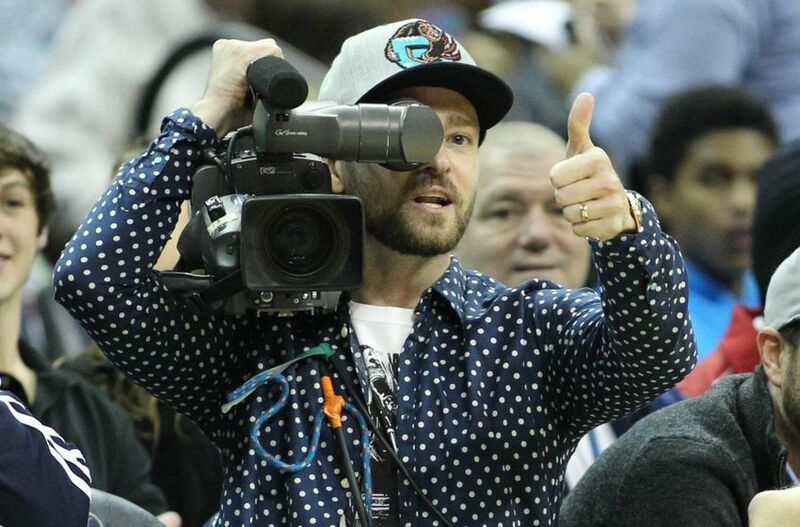 Do they need two Jeff Greens? 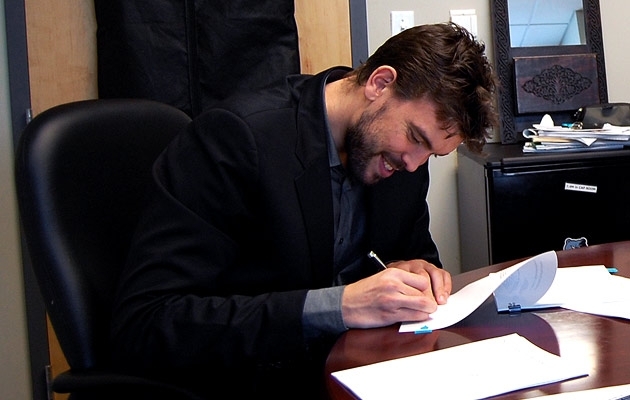 Or are the Grizzlies writing something on the wall in permanent marker? They took an European player whom they can stash for several years. 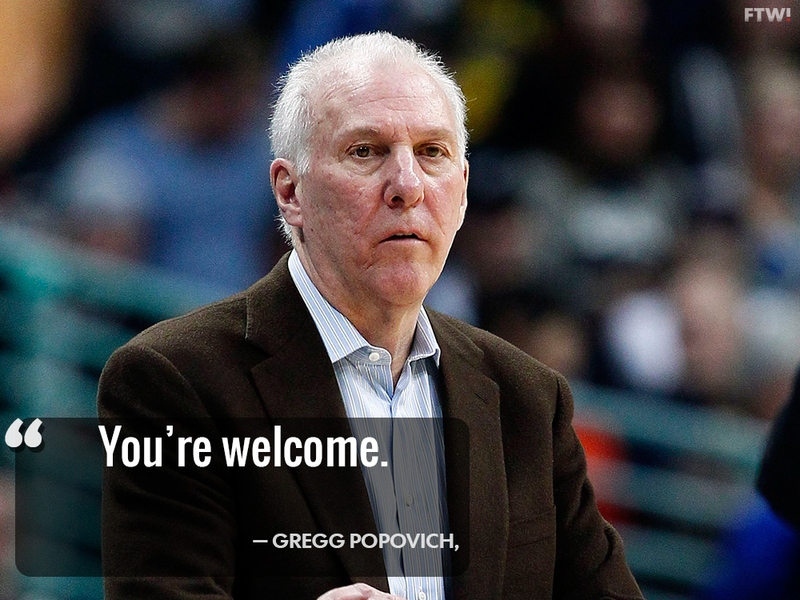 And Popovich wins the draft again. Kudos to Billy King and Lionel Hollins for finally making a trade that screws over the other team. Hollis-Jefferson may not set the scoreboard on fire, but he could step out on the court and guard players like Carmelo Anthony, Jimmy Butler, and Kyle Korver today. 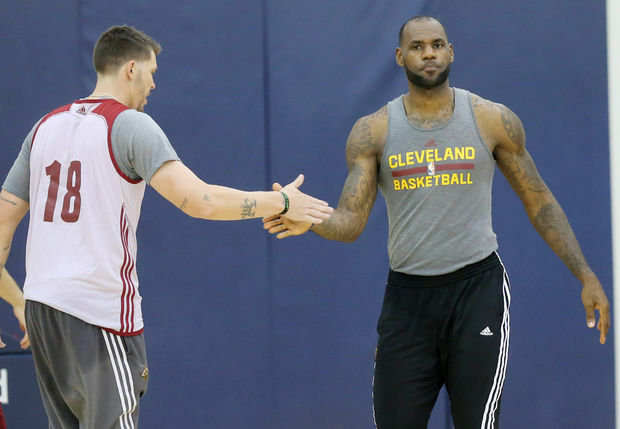 He needs a few months of training before he gets up to LeBron’s level. Kevon Looney, a potential top 10 pick at the beginning of the season, fell all the way to the Dubs at number 30. The rich keep on getting richer. 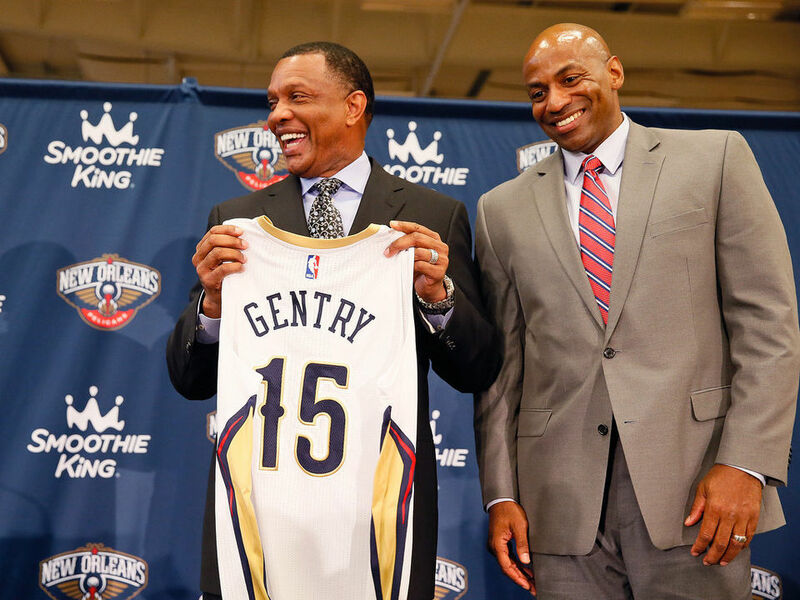 The Pelicans drafted Branden Dawson in the 2nd round, but the biggest acquisition thus far is new head coach Alvin Gentry. He was the architect of the Warriors world-beating offense, and now he has the league’s most versatile and unguardable player at his disposal. Long live The Brow! The Clippers didn’t have a draft pick, some big names may leave the team in free agency, and their new uniforms look like they were made at Kinkos. This might be their year after all. 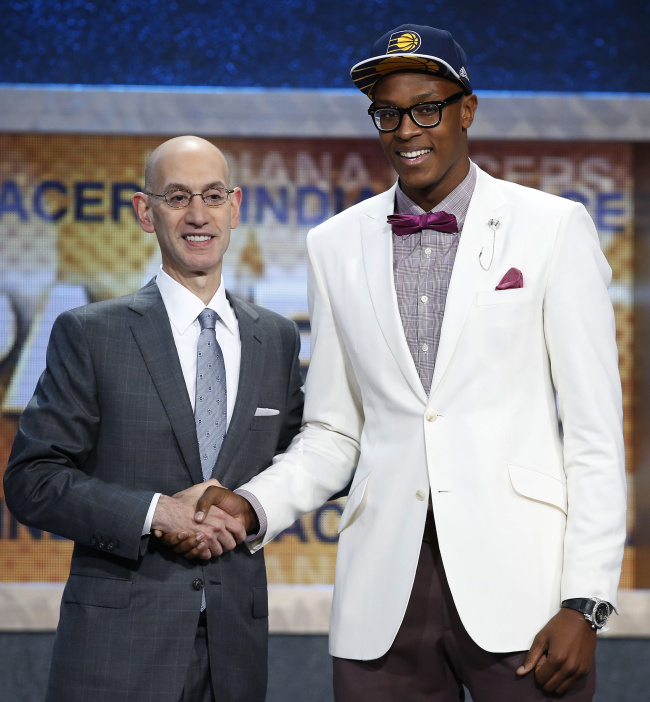 Unlike last year’s draft, 2015 has the potential to be the most interesting in recent memory. Plenty of teams are trying to trade for veterans and draft picks a like in order to establish themselves a potential playoff contenders. Teams like the Knicks, Lakers, Kings and Nuggets have been burning up the rumor mill, trying to make drastic roster overhauls. Other teams, like the Timberwolves and Magic, are trying to build upon already impressive young rosters. 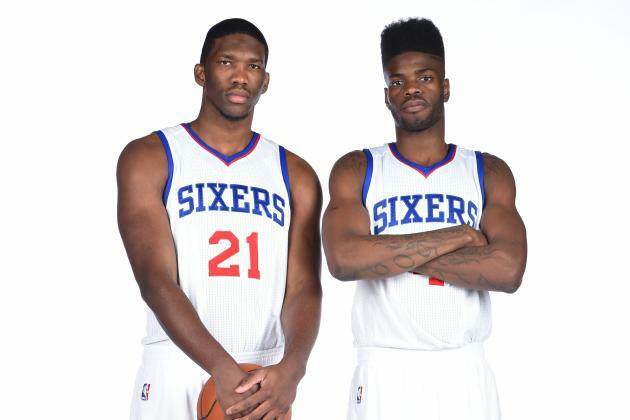 And the Philadelphia 76ers are…still rebuilding…I guess. No one really knows what they are doing, but apparently, it’s all part of the plan. 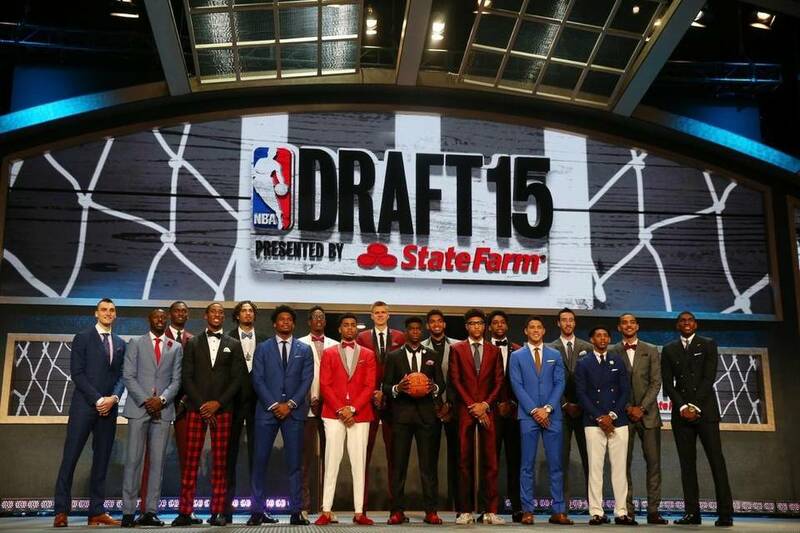 Without further delay, here is my first and final 2015 NBA Mock draft. 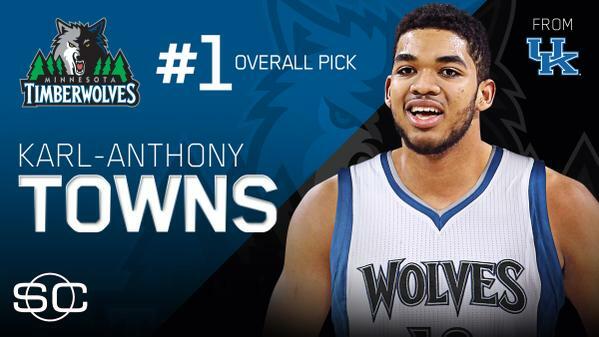 1) Minnesota Timberwolves: Karl-Anthony Towns, Kentucky, PF/C, Freshman. This appears to be the only lock in the entire draft. With reports of the T’wolves making promises to Towns and his camp, the Kentucky freshman appears to be guaranteed in Minnesota next season. Wiggins, Rubio, LaVine, and the 7’0″ big man from the Dominican Republic will form a tremendous core for Flip Saunders to build upon. 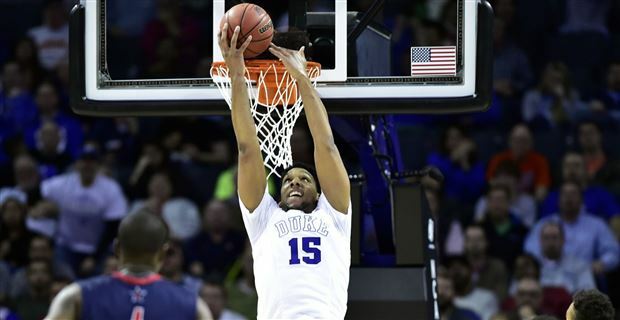 2) Los Angeles Lakers: Jahlil Okafor, Duke, C, Freshman. 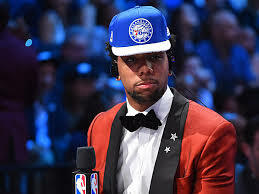 With reports that the Laker’s front office is “80-20” in favor of drafting Okafor over Russell, it appears that barring any trades this will be how it plays out. 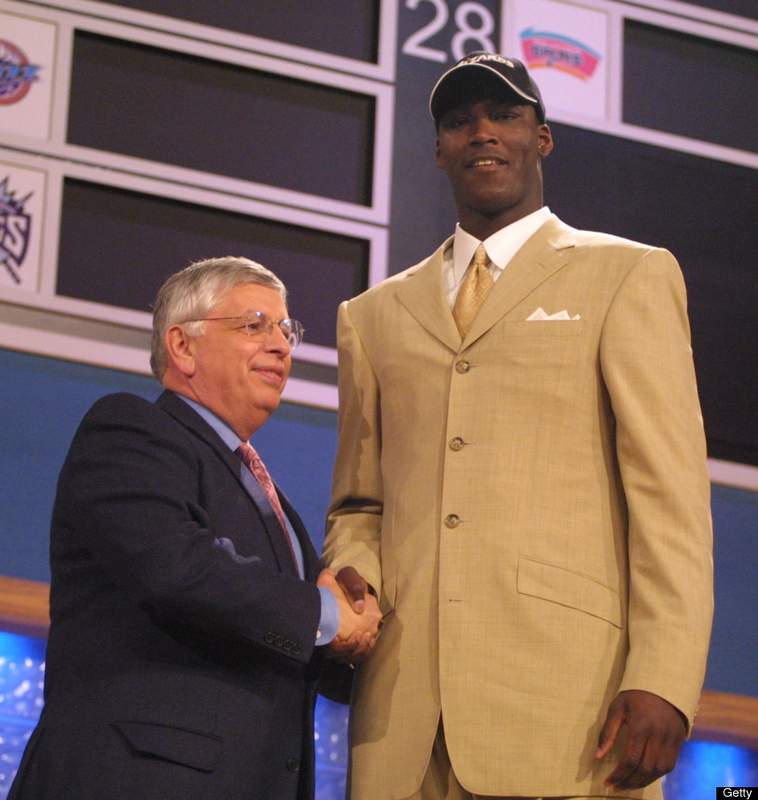 If this was 2005 and not 2015, Okafor would be the consensus number one overall selection. However, with low-post building blocks becoming a thing of the past, the Lakers are still making the smart choice with this pick. The Duke big man may not have as much potential as Towns or Kristaps Prozingis, but Okafor has the highest floor of anyone in this draft. He should help to cushion the blow when the Kobe Bryant era ends. 3) Detroit Pistons (trade with Philadelphia 76ers): Kristaps Porzingis, Sevilla, PF, Age 19. DET receives 3rd overall pick and SG/SF Hollis Thompson. 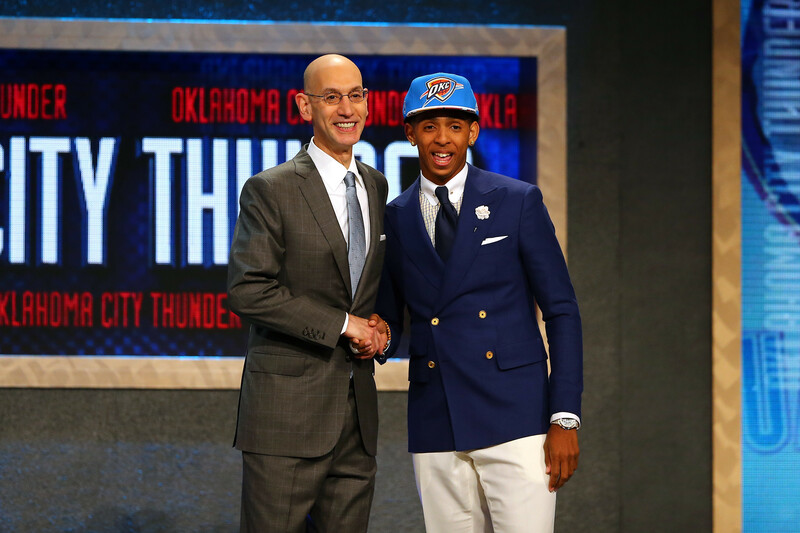 PHI receives 8th overall pick, Brandon Jennings, and 2016 Top-10 protected 1st round pick. The Pistons really want to try an compete for a playoff spot next year. The Pistons have a few key free agents they would like to bring back (Reggie Jackson, Greg Monroe), but a lack of the cap space to do so. Stan Van Gundy seems to be a bigger fan of Reggie Jackson than of Greg Monroe. Monroe is an awkward fit next to Andre Drummond leading to Van Gundy acquiring Ersan Ilyasova this offseason to provide better floor spacing. However, acquiring Porzingis may put this team over the top. Porzingis has the potential to be a new breed of power forward (think Nikola Mirotic with Nerlens Noel type athleticism). He may not be a franchise player, but Porzingis can be a border line all-star for years to come. The 76ers acquire an asset (Brandon Jennings), a future first round pick, and they still get to draft the player they want (more on that later). 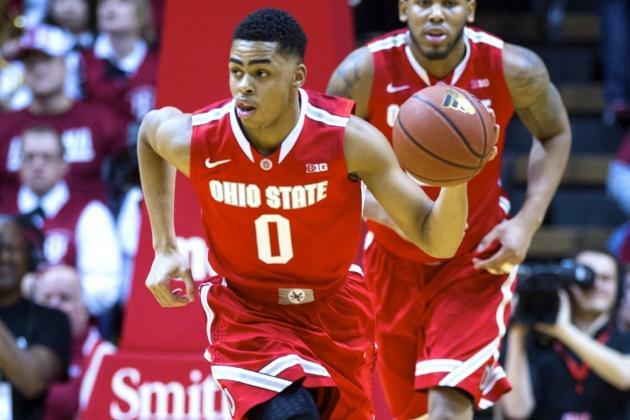 4) New York Knicks: D’Angelo Russell, Ohio State, PG/SG, Freshman. Good job New York; you finally got lucky. Now please, don’t screw this up. 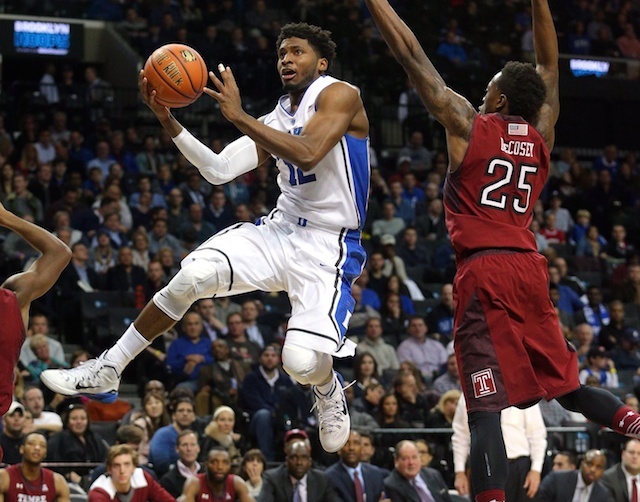 5) Orlando Magic: Justise Winslow, Duke, SF, Freshman. With Tobias Harris set to hit free agency and new head coach Scott Skiles taking over, Winslow seems like the obvious draft choice. His defensive ability will make him a perfect fit for Skiles’ defense, while his position and burgeoning offensive skills make him the perfect replacement for Harris. 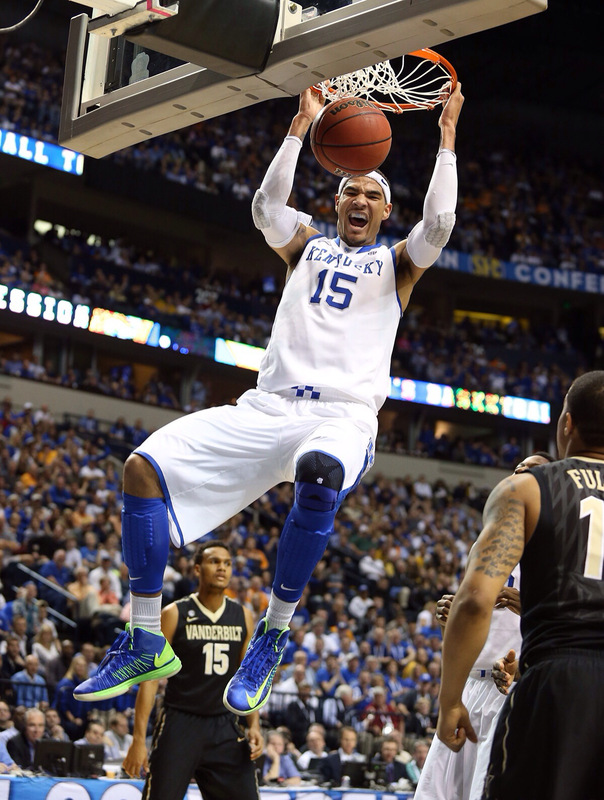 6) Sacramento Kings: Willie Cauley-Stein, Kentucky, C/PF, Junior. I really wanted to put in a Ty Lawson to Sacramento trade in this post, but nothing really worked out. The Kings don’t have the assets to pull off a trade of that caliber. However, that does not mean the Kings won’t make a trade this Thursday. I just believe the trade will be more of a salary dump (Rudy Gay) in order for the team to make a run at Rajon Rondo or Goran Dragic. Cauley-Stein is the pick because the team appears to be set on adding a point guard via free agency and the two-guard spot is maned by both Ben McLemore and Nik Stauskas. 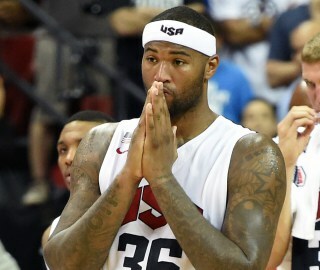 Plus it helps that Boogie is really good friends with WCS. 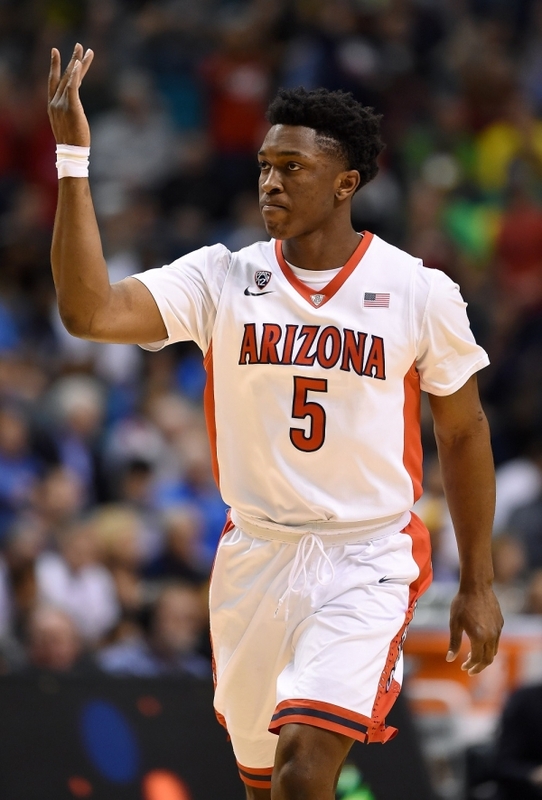 7) Denver Nuggets: Stanley Johnson, Arizona, SF, Freshman. With the Nuggets entering a rebuilding stage, the team should be focused on adding talent to their roster. Johnson is arguably the most talented player left on the board. He also projects to be one of the best defensive players in this draft, a skill set new head coach Mike Malone would like to fully utilize. 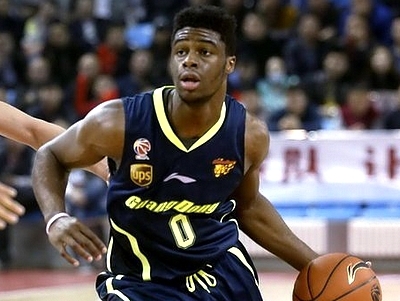 8) Philadelphia 76ers (trade with Detroit Pistons): Emmanuel Mudiay, Guangdong Southern Tigers (China), PG, Age 19. Mudiay has been Sam Hinkie’s guy since last year. Before heading to China, the talented point guard was considered the number one overall prospect in this year’s draft class. An ankle injury and questions about his shooting ability have caused his stock to fall. However, the 19 yeard old fills a huge need for the eternally rebuilding 76ers. 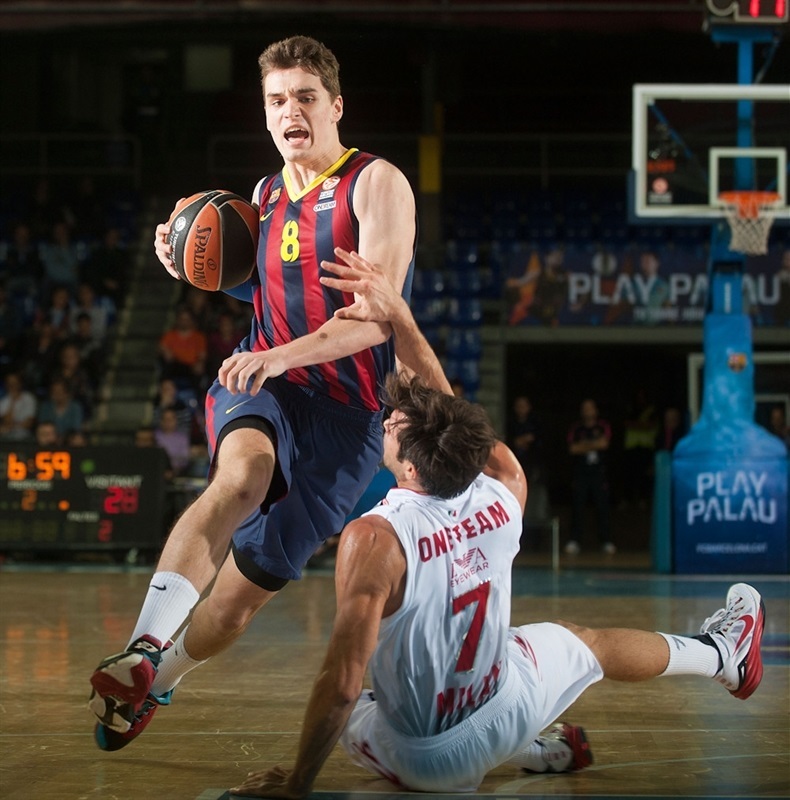 9) Boston Celtics (trade with Charlotte Hornets): Mario Hezonja, FC Barcelona, SG/SF, Age 20. 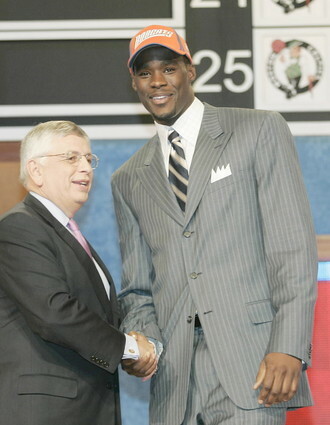 BOS receives #9 overall pick and Jeff Taylor, and Marvin Williams. CHA receives #16 overall pick, #33 overall pick (2nd round). He’s being compared to Jimmy Butler and Kobe Bryant, and the Celtics need someone of that caliber on their roster. They are also thin at the power forward and the wing. This trade nets the Celtics another body at small forward, as well as a replacement for Brandon Bass. 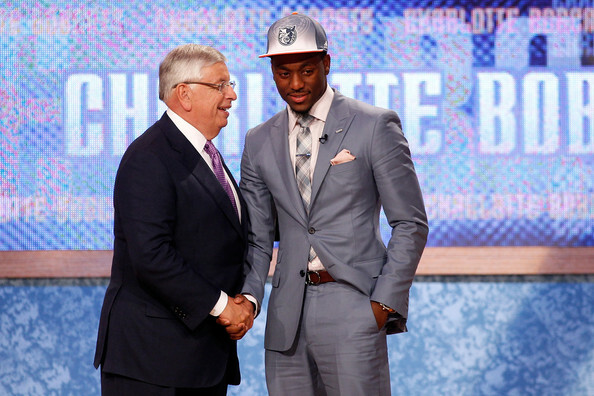 Charlotte can dump some salary and remain in range to draft the player they truly want. 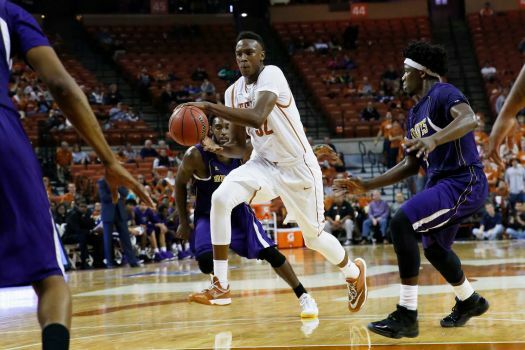 10) Miami Heat: Myles Turner, Texas, C/PF, Freshman. When Chris Bosh was out of the lineup last year due to blood clots, the Heat’s offense suffered greatly. They needed a front line player who could help space the floor an allow for Dwayne Wade and Luol Deng to cut to the paint. Turner is that type of player. Not only can he space the floor, but his face-up game will allow for him to seamlessly integrate with Bosh and Hassan Whiteside in Miami’s front court. 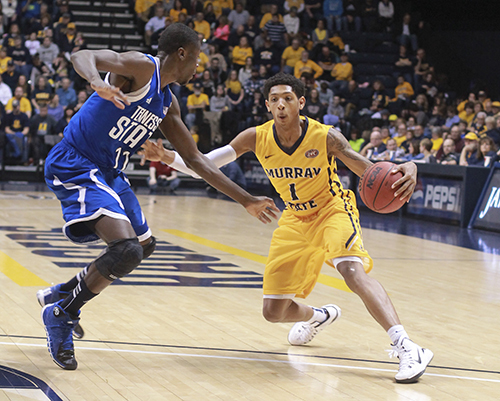 11) Indiana Pacers: Cameron Payne, Murray State, PG, Sophomore. Payne is this year’s mid-major draft darling. His shooting stroke needs some work but he can attack the basket with ease, and he is a pick-and-roll maestro. The Pacers need some more scoring power next to Paul George, and a better point guard option then George Hill. Payne provides Indiana with both, as well as allow the team to run some interesting two point guard offensive sets like Pheonix and Toronto. 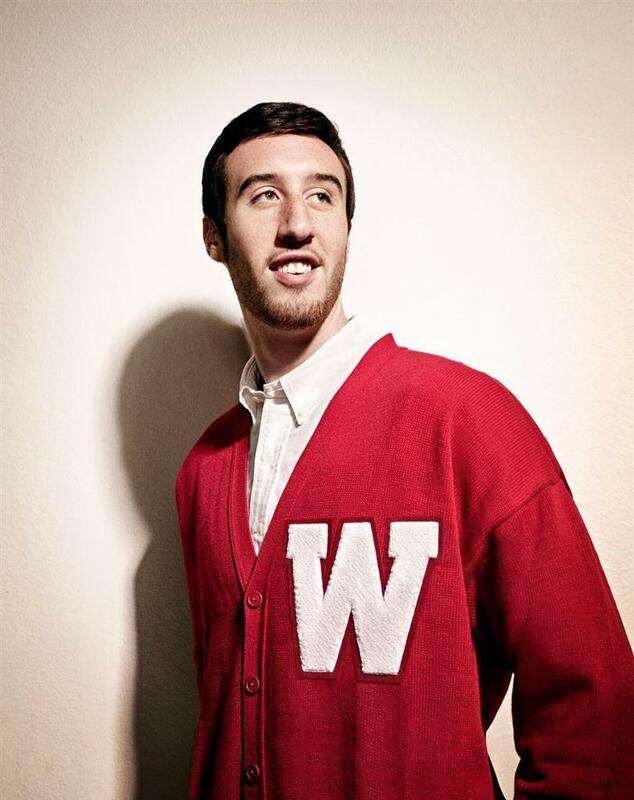 12) Utah Jazz: Frank Kaminsky, PF/C, Wisconsin, Senior. Rudy Gobert and Derrick Favors appear to be two of the three building blocks of Utah’s future. With Gordon Hayward (the 3rd building block) and Rodney Hood being the only players who can affectively stretch the floor, the Jazz need someone who can provide spacing for their offense. Enter Kaminksy, Naismith Player of the Year and media darling. His three-point shooting and passing ability will allow him to play with both Favors and Gobert. 13) Phoenix Suns: Sam Dekker, Wisconsin, SF, Junior. With Gerald Green on the way out of the door, the Suns desperately need shooting from the wings. Enter Dekker, who shot 33 percent from three at Wisconsin last season, but is capable of shooting much better (39 percent his freshman year). He’s a player who can come off of the bench and play next to Brandon Knight and Eric Bledsoe. 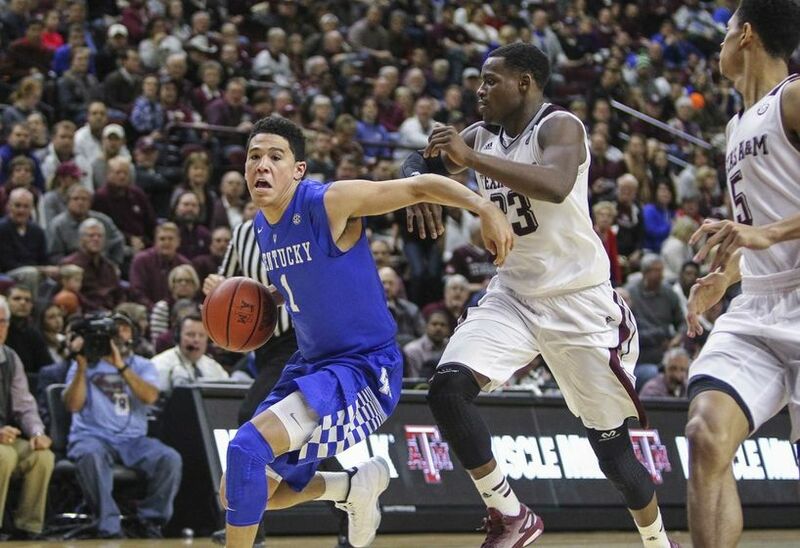 14) Oklahoma City Thunder: Devin Booker, Kentucky, SG, Freshman. The Thunder have been the hardest lottery team to gauge and I believe that is because they are just going to take the best player available. Kevin Durant missed most of last season with a variety of injuries, and the team is two-deep at every position, therefore I believe they are going to draft who they deem as the best prospect left on the board. In this case, it’s Booker. He’s a very similar player to Anthony Morrow, but with higher upside. Booker should pair nicely with Durant and Westbrook. 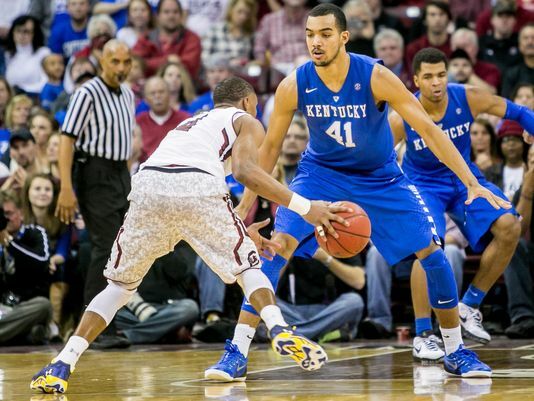 15) Atlanta Hawks: Trey Lyles, Kentucky, SF/PF, Freshman. With DeMarre Carroll and Paul Millsap testing free agency this off-season, the Hawks need to prepare for one, if not both, to leave the team. 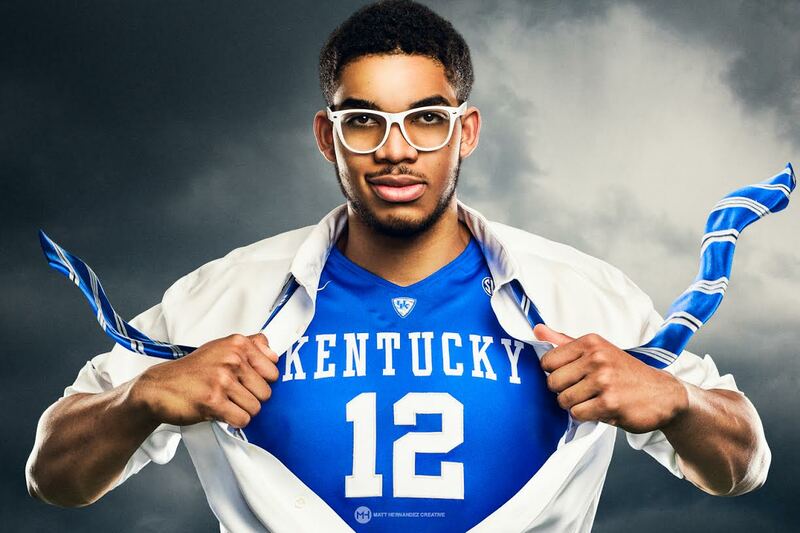 Enter Lyles, the Kentucky combo-forward. Lyles exhibits traits from both players, and he’s young enough to develop into a solid player in Atlanta’s offensive system. 16) Charlotte Hornets (trade with Boston Celtics): R.J. Hunter, Georgia State, SG, Junior. 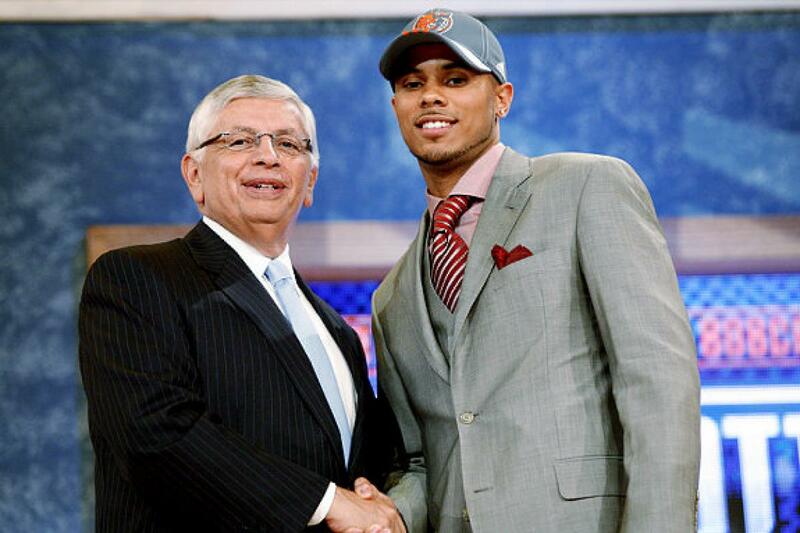 After trading Gerald Henderson to the Trail Blazers earlier today, the Hornets are going to draft his replacement. Hunter has had a lot of great workouts the past few weeks, and a lot of teams in the bottom of the lottery showed interest. One of those teams was the Hornets. At the 9th pick, Hunter would represent a huge reach. However, at the 16th pick Hunter would to be a great value, especially for a team that struggled to hit three pointers like the Hornets did last year. 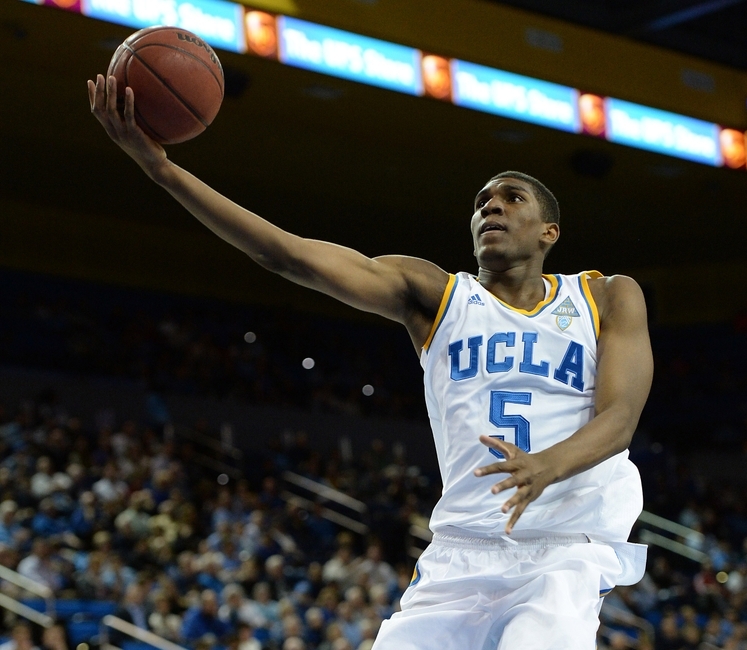 17) Brooklyn Nets (trade with Milwaukee Bucks): Kevon Looney, UCLA, SF/PF, Frehman. 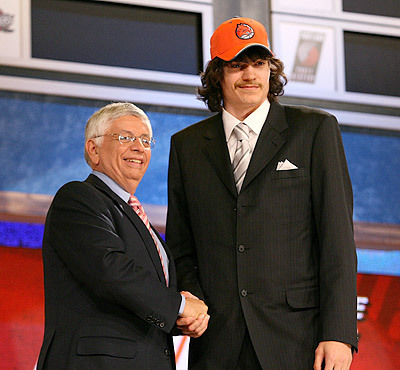 BKN receives #17 overall draft pick. 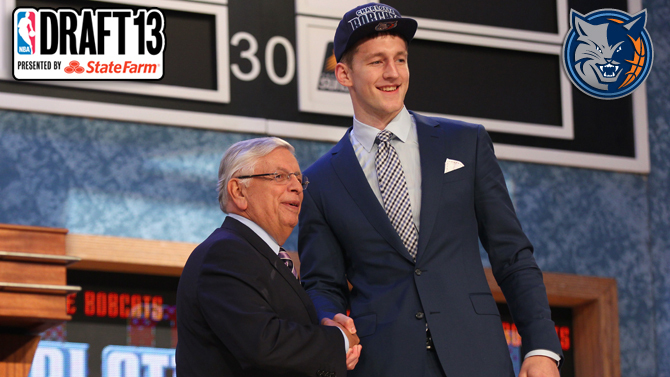 MIL receives #29 overall draft pick and PF/C Mason Plumlee. The Nets have been trying to use Mason Plumlee to move up in the draft for weeks now. The Milwaukee Bucks are a playoff with plenty of wholes to fill and not enough cap space to fill them. 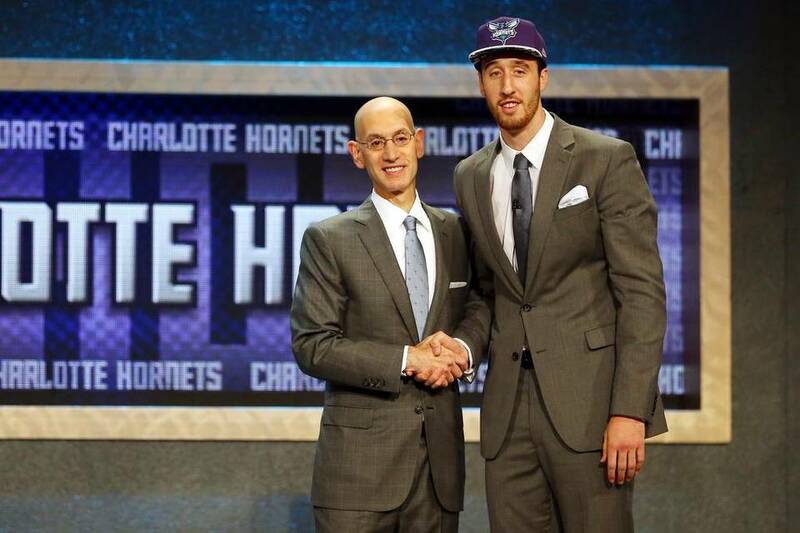 Jason Kidd was the coach who drafted Plumlee in 2013, and his brother Miles was aquired by the team at last year’s trade deadline. Sometimes the stars align too perfectly. Plumlee would bolster the Bucks front court, while the trade would allow the Nets to acquire the ultra-talented, extremely raw Kevon Looney to replace Plumlee and the soon-to-be free agent Thaddeus Young. Looney was a top-5 pick before this season, and while the talent is there, the overall skill is not. In desperate need of youth, the Nets take a flyer on a player who could be part of the next wave of stretch-fours in the NBA. 18) Houston Rockets: Jerian Grant, Notre Dame, PG, Freshman. The Rockets hopelessly need a secondary playmaker behind James Harden. Grant fills that need, as well as provide versatility and shooting for both guard positions. The addition of Grant would force Jason Terry back to shooting guard, and allow for Patrick Beverly to strictly play with James Harden. 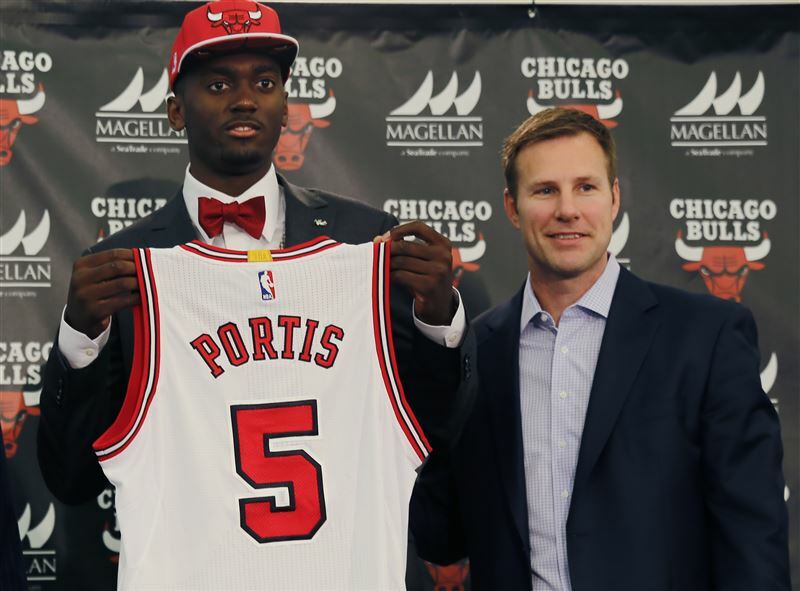 19) Washington Wizards: Bobby Portis, PF, Arkansas, Sophomore. When Nene was hurt in these past playoffs, the Wizards survived by playing small ball with Paul Pierce at the power forward and Otto Porter Jr. at small forward. With Pierce gone, the Wiz need to draft an insurance policy and eventual replacement for Nene. Portis man not have three-point range, but he does have a good jumper, and a budding face up game to compliment Marcin Gortat. 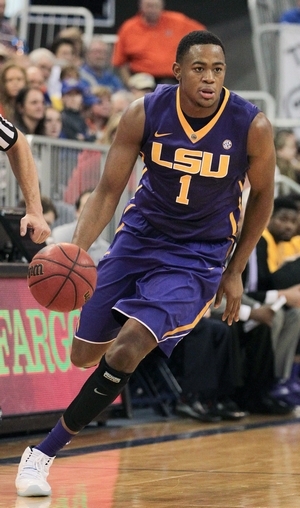 20) Toronto Raptors: Jarell Martin, LSU, SF/PF, Sophomore. News broke that Martin has received a 1st round promise from a team in the bottom part of the draft. Many people believe it to be the Memphis Grizzles, but I believe the Raptors are that team. Martin might be a tweener, but he does fill two positions of need for the “Drakes”: the forward spots. Martin kills two birds with one stone, and adds talent to a roster on the verge of contention. 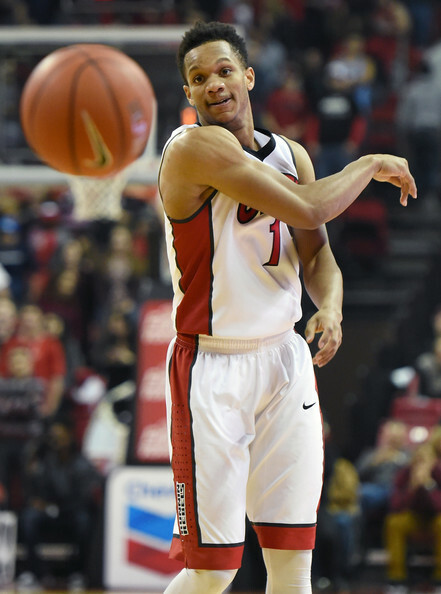 21) Philadelphia 76ers (trade with Dallas Mavericks): Rashad Vaughn, UNLV, SG, Freshman. PHI receives #21 overall draft pick, 2016 and 2017 2nd round picks. DAL receives Brandon Jennings and Jerami Grant. This trade allows for the 76ers to acquire another talented young player to help with their rebuild, while the Mavericks replace the production lost from Rajon Rondo, Monta Ellis, and Al-Farouq Aminu. This trade also allows for the Mavs to save what little cap flexibility they have left, preparing them to make a run at an upper-level free agent prospect (LaMarcus Aldridge? Dwayne Wade?). 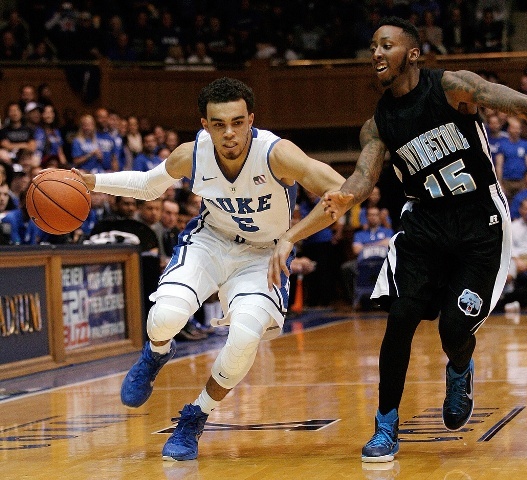 22) Chicago Bulls: Tyus Jones, Duke, PG, Freshman. Aaron Brooks appears to be hitting the open market, and the Bulls are in need of a dependable backup to Derrick Rose. Enter Jones, who is fresh off leading Duke to a National Championship. Jones could serve as a calming force for Chicago’s second unit, as well as DRose’s possible replacement. 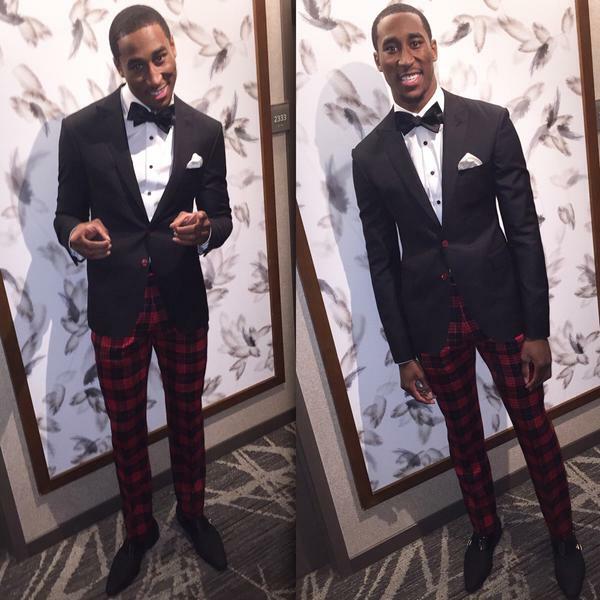 23) Portland Trail Blazers: Rondae Hollis-Jefferson, Arizona, SG/SF, Sophomore. With news of the team trading Nicholas Batum to the Hornets, the Blazers are in need of a cheap replacement. RHJ has the skill-set to be the next Tony Allen, and he comes as a cheap alternative to Batum. The money saved could be used for Portland to pursue they’re own free agents, or possibly bring in their replacements. 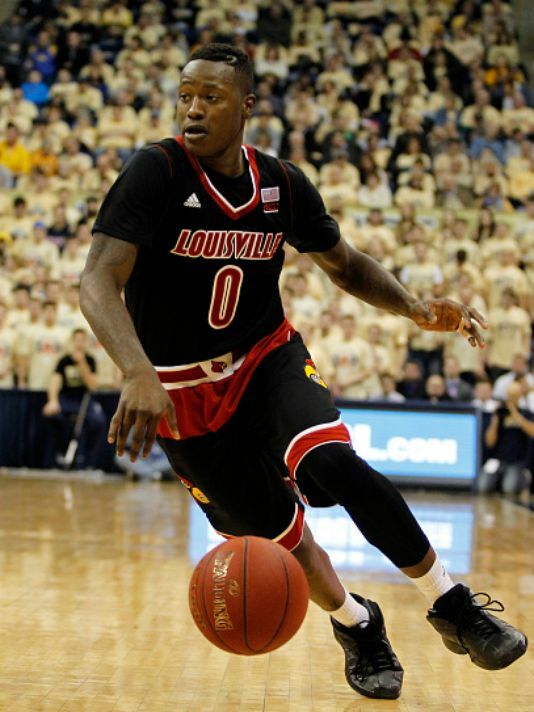 24) Cleveland Cavaliers: Terry Rozier, Louisville, PG/SG, Junior. With J.R. Smith opting out of his contract, the Cavaliers have the opportunity to add a player who can replace his production, while providing a better complement to Matthew Dellavedova and Kyrie Irving. Rozier can effectively play both guard spots, as well as score in bunches. 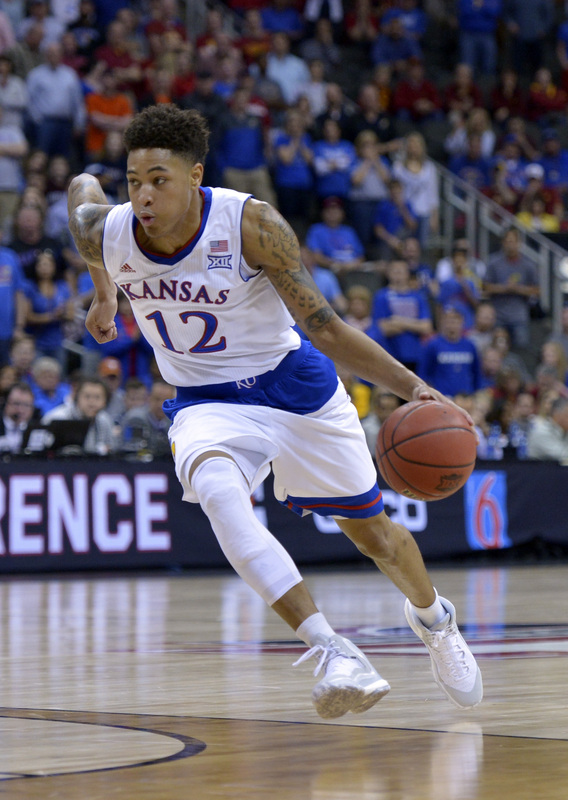 25) Memphis Grizzlies: Kelly Oubre Jr., Kansas, SG/SF, Freshman. Oubre has top ten talent, but produced like a second round pick this past year at Kansas. The Grizzlies are a team that needs to swing for the fences due to their inability to attract free agents. Look for Memphis to take a swing at the former Jayhawk in hopes he plays up to his potential. 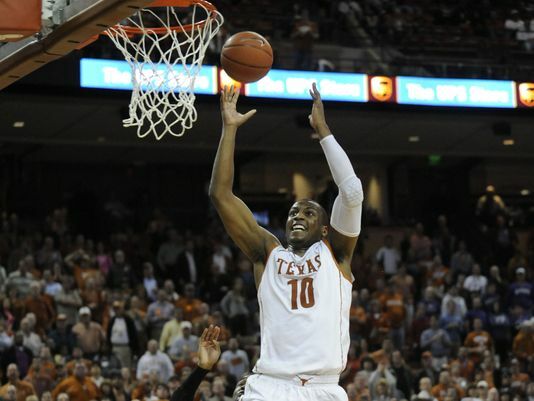 26) San Antonio Spurs: Jonathan Holmes, Texas, SF/PF, Senior. 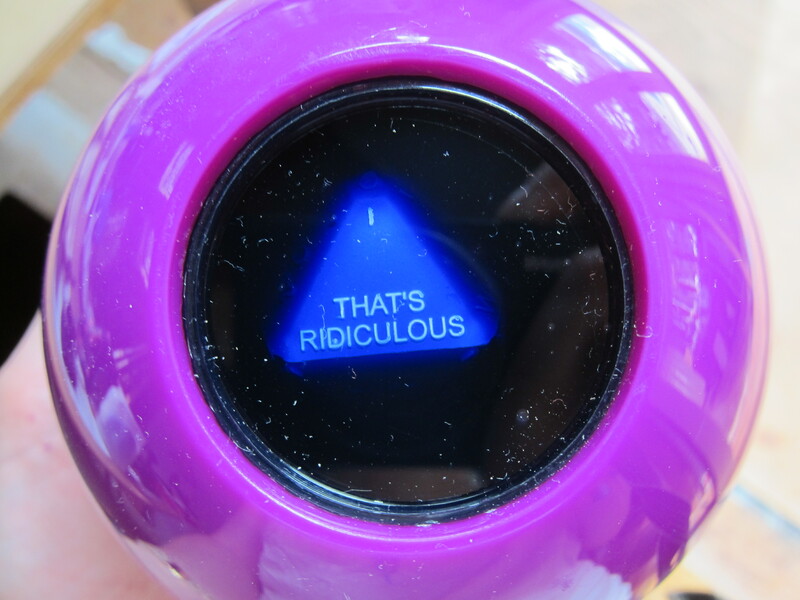 The Spurs draft targets are always very tough to gauge. Holmes is a versatile prospect who could fill a variety of weaknesses for the veteran ball club. They also could trade the pick…or draft an international prospect to draft overseas…or trade down. 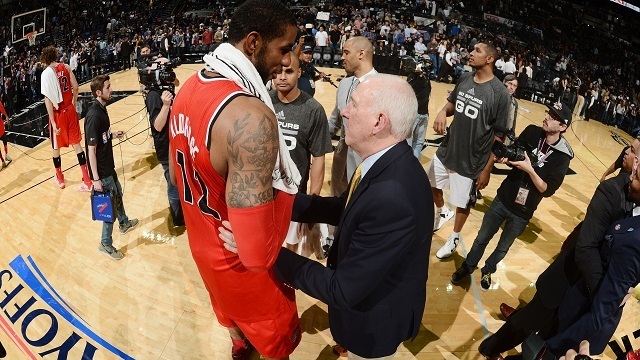 They can literally do anything because Gregg Popovich and R.C. Buford seem to be the best drafters in NBA history. Whatever they decide to do, it’ll be the right decision. 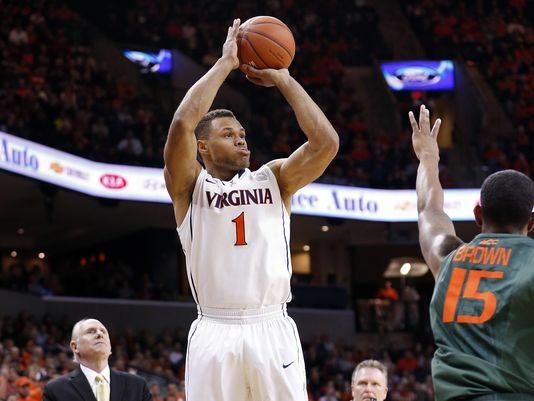 27) Los Angeles Lakers: Justin Anderson, Virginia, SG/SF, Junior. 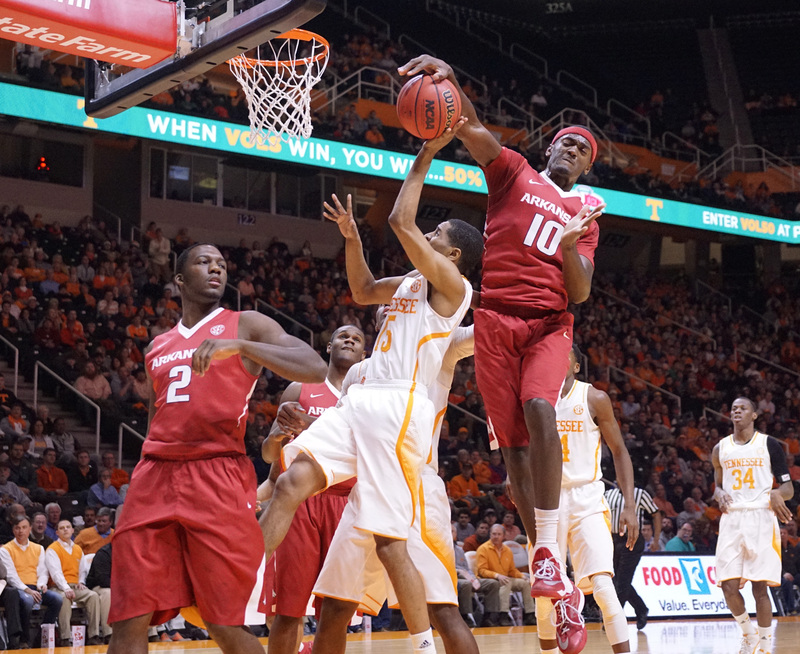 Without much depth at small forward, Anderson seems like a give-me at this point in the draft. 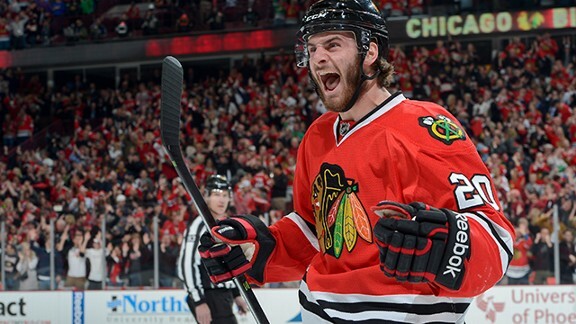 The junior can provide a solid 3-and-D presence for a team trying to win-now. He also possesses just enough potential to grow into a rock solid starting wing. 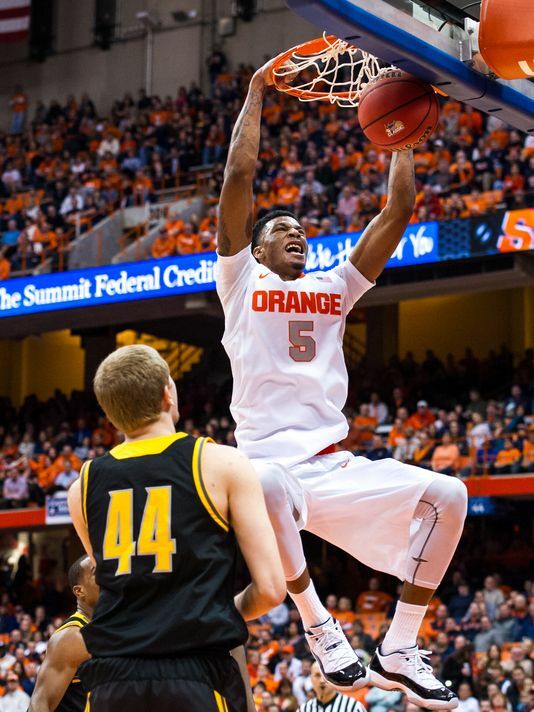 28) Boston Celtics: Chris McCullough, Syracuse, PF/C, Freshman. With their second pick of the round, the Celtics try a hit a home run by drafting McCullough. Despite the fact he tore his ACL last season, the Syracuse product displayed the ability to help space the offense while blocking shots from both the weak and strong sides on defense. Boston can afford to let the McCullough grow and develop into a stronger player. 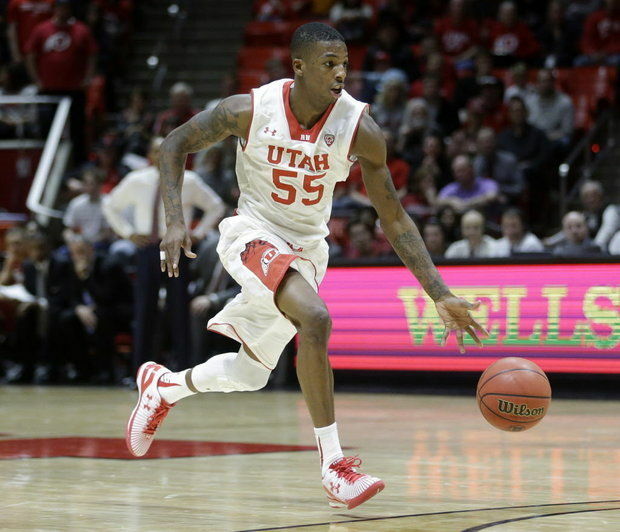 29) Milwaukee Bucks (trade with Brooklyn Nets): Delon Wright, Utah, PG, Senior. 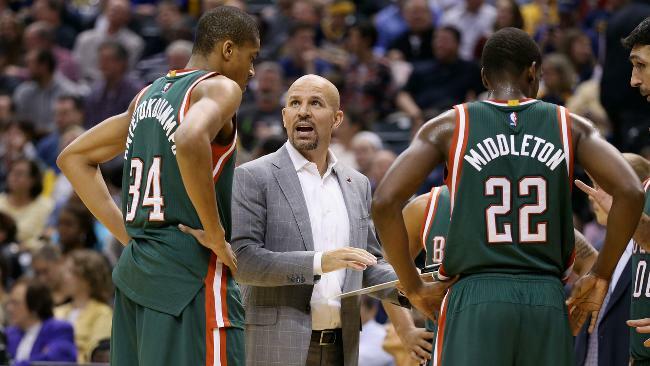 Jason Kidd has a thing for long, athletic point guard prospects who can’t shoot. Wright could be next in a line on this long list on point guards Kidd is trying to develop. The Warriors won a championship because of their interchangeable and versatile defense. Drafting Wright would allow for the Bucks to create a similar defensive scheme. 30) Golden State Warriors: Montrezl Harrell, Louisville, PF, Junior. After winning the NBA finals, the Warriors don’t have as many needs as people would believe. However, with David Lee seeking a trade, the Dubs need to find someone to fill his void. Harrell would add toughness and athleticism to the defending champs, as well as the ability to play more small-ball. Harrell has the toughness to play center in small line-ups, without the Golden State giving up their defensive identity.